Quackgrass: This weed grass is often mistaken for crabgrass. Its leaves are coarse, wider than the regular lawn. 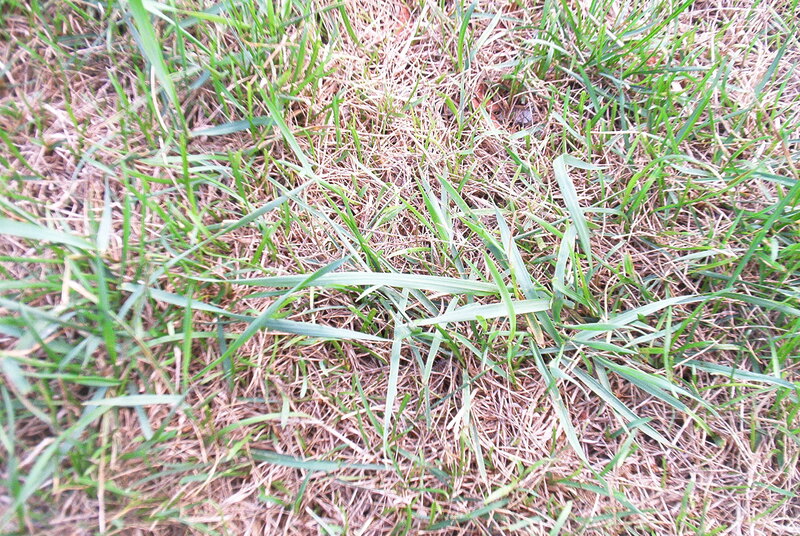 If you find "crabgrass" in your lawn in April or May, it is most likely quackgrass as quackgrass lives through the winter. Quackgrass is generally most noticeable a few days after the lawn has been mowed. It grows quickly - You cut the lawn on Tuesday and it seems that by Wednesday night the quackgrass is already higher than the rest of the lawn. The new growth is light green: older blades have a blue-grey-green colour. If you pull on the grass you may find white underground stems. Quackgrass is very deeply rooted. This means that it is able to survive the lack of moisture better than lawn grasses. Quackgrass can continue to spread even under drought conditions. Control of Quackgrass is not easy. (These instructions will also work for other weed grasses.) There are no products that selectively kill quackgrass. In other words, we cannot spray the whole lawn and control only the quackgrass. If you live in a jurisdiction that permits the use of Roundup or other products that contain glyphosate, see below. In Ontario, there aren't any products that do a very good job of eradicating quackgrass. There are no easy or quick solutions. Vinegar and fatty acid herbicides will kill off the tops of the quackgrass, but it will re-grow from the roots. If the quackgrass is growing on your patio, you can apply these products every few weeks. As soon as the quackgrass starts to shoot up some green foliage, give it a spray. Over a period of time, the food stored in the roots will slowly become depleted, the plant will become weaker and will slowly die. This process is much harder to maintain when the quackgrass is growing in your lawn. Having dead patches of grass will likely spoil the appearance of the lawn. If the area is small, digging up the quackgrass may be an option. To do this thoroughly, you must remove at least 8 inches of soil, sometimes more. All of the long pieces of underground stems (they are white and look like coarse roots) must be removed. Quackgrass can grow back from pieces left behind that are as short as a couple of inches. If the area that is infested is large and you are thinking about resodding, you could rototill the area. However, the first problem with this is that a rototiller will chop up the quackgrass roots into hundreds of small pieces. So, instead of twenty plants you may now have 700 pieces of roots, each of which could grow. If you are going to rototill, it is best to be prepared to do without a lawn for a while. After rototilling, some roots will be on the surface. Rake them up and remove them as much as possible. If the rototilling is done during the hot summer weather, the roots that are on the surface or near the surface may dry out and die if they do not receive enough moisture. Once the roots near the surface have died, rototill the soil again to bring new roots to the surface closer to the sun and heat. Unfortunately, this is not a fool-proof method and will require at least several rototillings to kill off much of the quackgrass. On an ongoing basis, mow the lawn regularly at a 2 1/2 to 3 inch setting. Do not allow the quackgrass to grow tall. When the quackgrass grows tall, it is able to create food and store it in the roots. Keeping the quack grass cut short will lessen its ability to manufacture food. A non-selective herbicide such as Roundup will control quackgrass very well. The problem is that it will also control your lawn grass. Often, lawns are infested with quackgrass over 25-40% of the lawn. At that point most people say that they are not prepared to do a major renovation of half the lawn or more. "We'll live with it. At least it's green." If Roundup is available, we do NOT recommend digging up the quackgrass. One customer thought he could. When we came to look at his lawn, and it was a half-acre lot, there were a hundred or more circles of fresh topsoil where he had dug out the quackgrass. However, quackgrass roots are so hardy that a piece of root only a couple of inches long will grow back. At this particular customer's, in a year or two there was a lot of quackgrass coming up around the newly seeded areas.